I’ll start with the radio interview I did on Monday morning. Tom Kief of the Tom and Emily show on 95 WIIL ROCK tweeted me the link to the audio, and I’ve included it below. 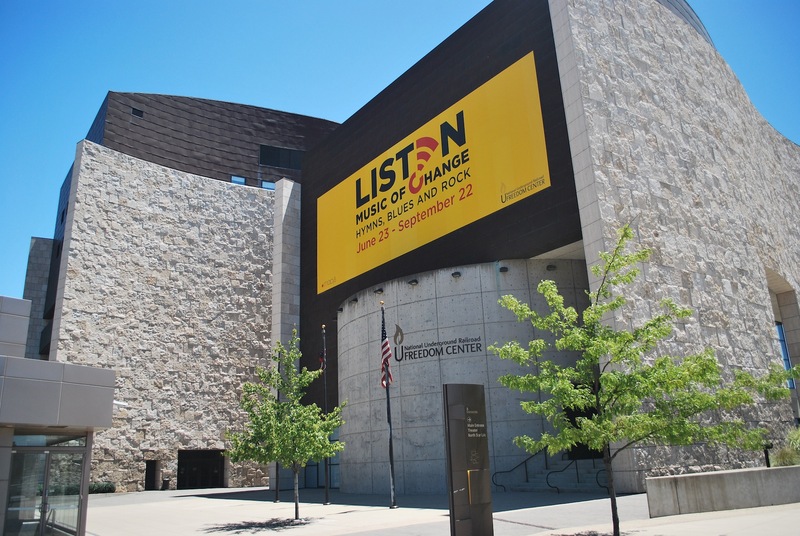 I talk about the mission and clear up some misconceptions that he even had about the registration and donor processes..
Tuesday, due to my Grandpa’s recommendation, I visited the National Underground Railroad Freedom Center. I left Prince’s place at 1:25, and was parked by Paul Brown Stadium by 1:40. 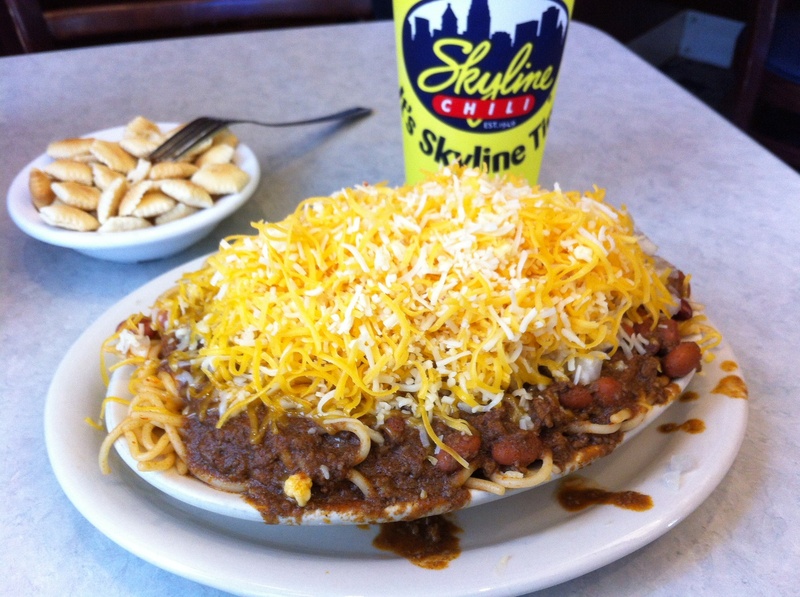 I hadn’t had lunch yet, so I walked up to the Skyline Chili on East 4th street. I ordered the 5-way extreme, which consisted of a bed of spaghetti noodles, their traditional secret-recipe chili, red beans, diced onions and habanero cheese. I just looked at the nutritional information online, and it’s about what I expected: 870 calories, 42 grams of fat (23 saturated), 1,790 mg of sodium, 70 grams of carbs, and 52 grams of proteins. Seeing as a I haven’t gained any weight since the season started, I think I can handle it. It was delicious, and I will likely be returning when I’m in Cincinnati about three weeks from now. I got done with lunch around 2:35 and walked back to the Freedom Center. It’s $12 for an adult, and with the amount of stuff you can see in there, it’s worth it. I thought over two hours would be enough (they close at 5 pm) but it wasn’t. I could’ve spent at least another hour in there. This is the Freedom Center as seen from Second Street. The main entrance is on the other side of the building, facing the river. 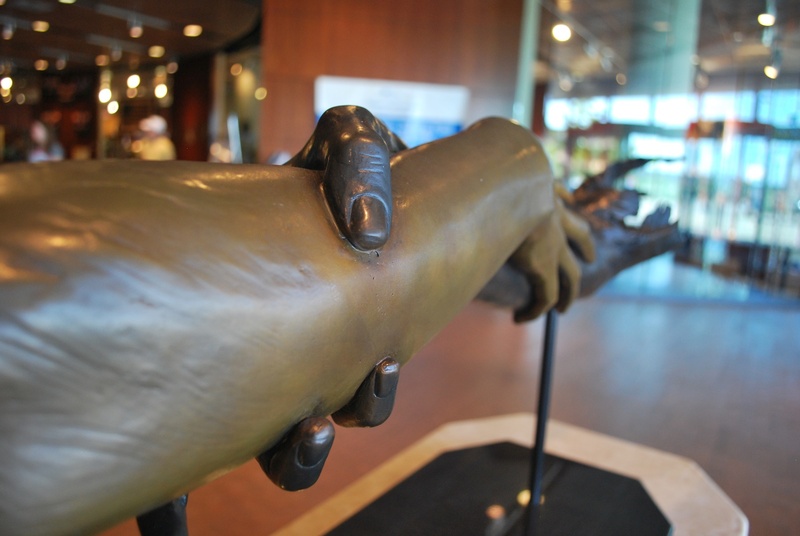 Just inside the doors there is a cool sculpture of two arms grasping one another. I basically got kicked out at 5:00 pm (they come around and inform people they’ll be closing in three minutes/and then tell you they’re closed). It was really interesting, but also frustrating, because of how those of European descent treated African-Americans. I’m just going to post two other pictures from my visit. 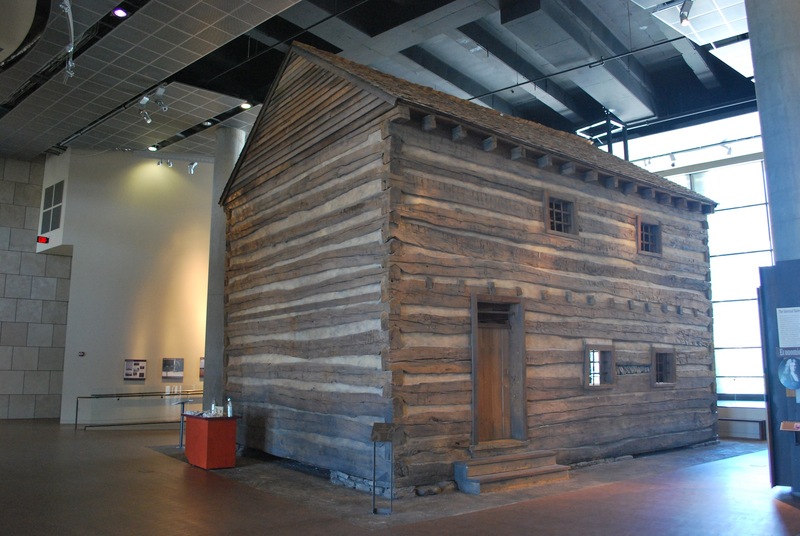 This first one is of the reconstructed “slave pen” that is standing on the second floor of the Freedom Center. This slave pen belonged to John W. Anderson, and this is where he would keep “his” slaves between deals with other buyers. 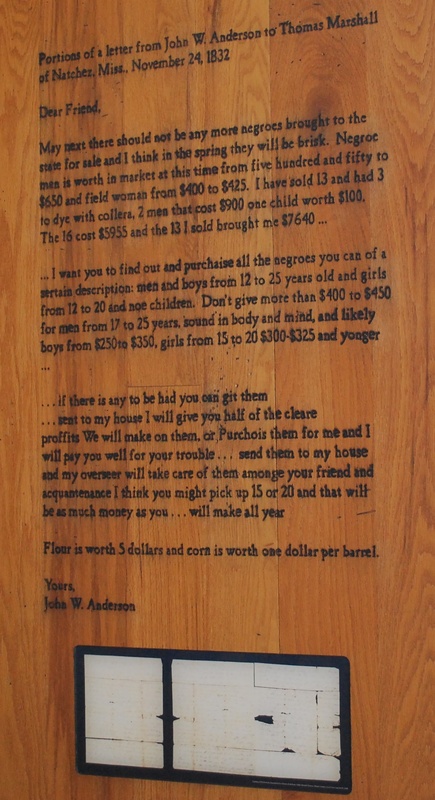 Next to the slave pen they have a letter that he had written to an acquaintance that detailed what type of slaves he wanted and what he’d be willing to pay for them. The letter is dated 1832, and shows how the internal slave trade persisted after Americans could no longer import slaves from other countries. You can click the image if you’d like to get a closer look. The few pictures I’ve included don’t do the Freedom Center justice, you should really check it out if you’re ever in Cincinnati. I love history, even if this is an ugly side to our country’s past. It happened, and the only way to move on is to understand what happened and honor those who risked their lives to help get others to freedom. 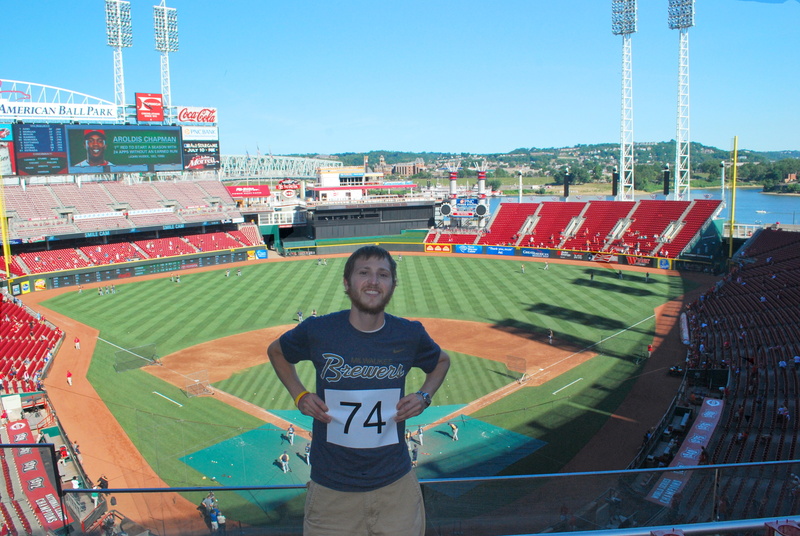 I walked around outside for a bit and then walked over to Great American Ballpark where I met up with Barry. We were inside right after the gates opened, and went to the upper deck to try and get game photo number 74. Most of the field was still sunny, but because it was 5:40 the seats were all in the shade and it made getting a good picture almost impossible. I also had one taken down by the field, but I’ll stick with the one from the upper deck for the time being. Mainly because I’ll be going on the field tomorrow to deliver the game ball and rosin bag to the mound, and I’m going to try and get a picture while on the field. Barry and I then went down to the field level and headed to our seats. Inside the home plate entrance they have two nice pieces of artwork that are made of tiles. 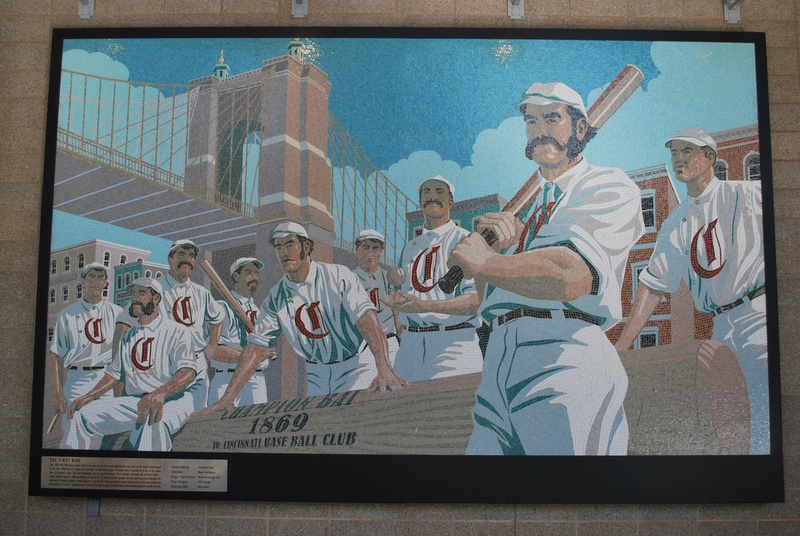 The first is of the “First Nine”, Cincinnati had the first professional team in 1869, and this piece commemorates that team. In the 1970’s the Reds had the Big Red Machine which consisted of Johnny Bench, Pete Rose, Joe Morgan, and Tony Pérez. 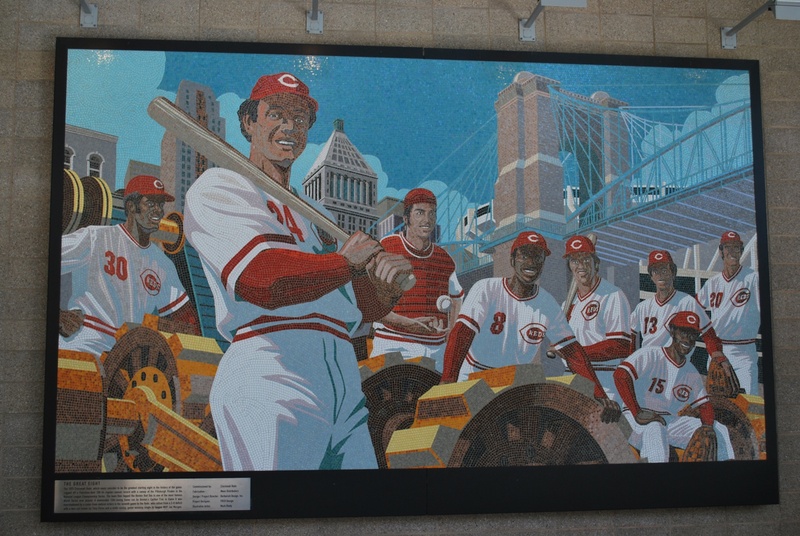 They were supported by four other players (Dave Concepción, George Foster, César Gerøonimo, and Ken Griffey, Sr.) and the other piece of artwork honors “The Great Eight” of 1975. Barry and I got to our seats with about 30-40 minutes before first pitch, talked baseball and waited for the game to start. 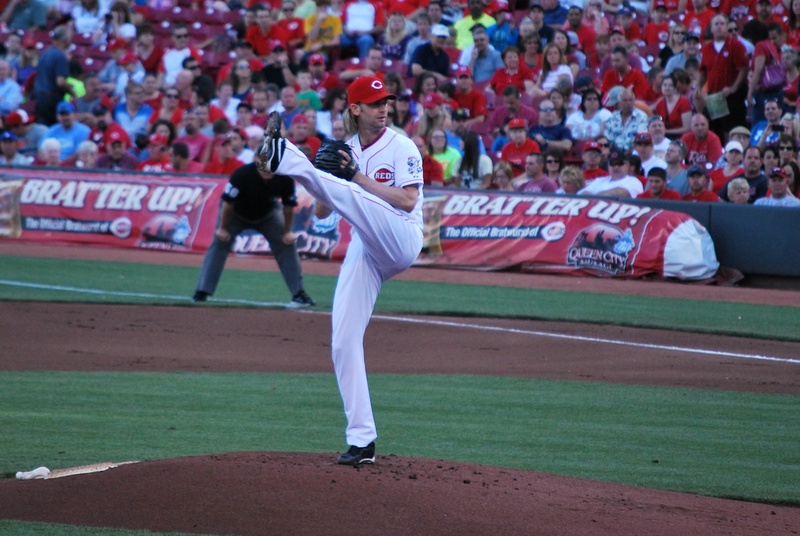 This was our view from section 115 when Bronson Arroyo delivered the first pitch of the game to Aoki. 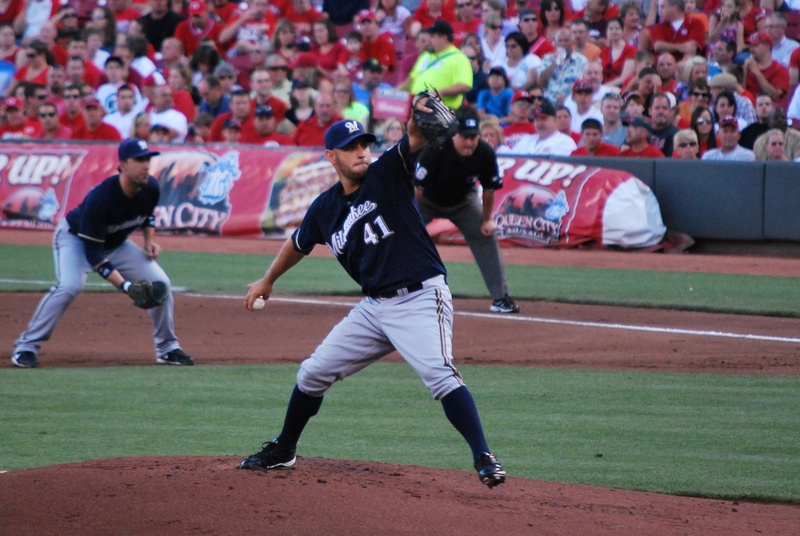 Arroyo was pitching great, and I have to include a picture of him for his efforts and to point out his extremely high leg kick. Marco Estrada, who had just been activated from the disabled list after a couple of minor league rehab starts, was on the hill for the Brewers. He also pitched well, and struck out 12 over six innings, meaning that 2/3 of the outs he recorded were via the strikeout. In the third inning, Zack Cozart (the Reds shortstop), hit one deep to centerfield. Nyjer Morgan retreated and made a nice catch as he crashed into the left-centerfield fence. Where he hit the fence was actually a gate, and he hit it so hard that it swung open. 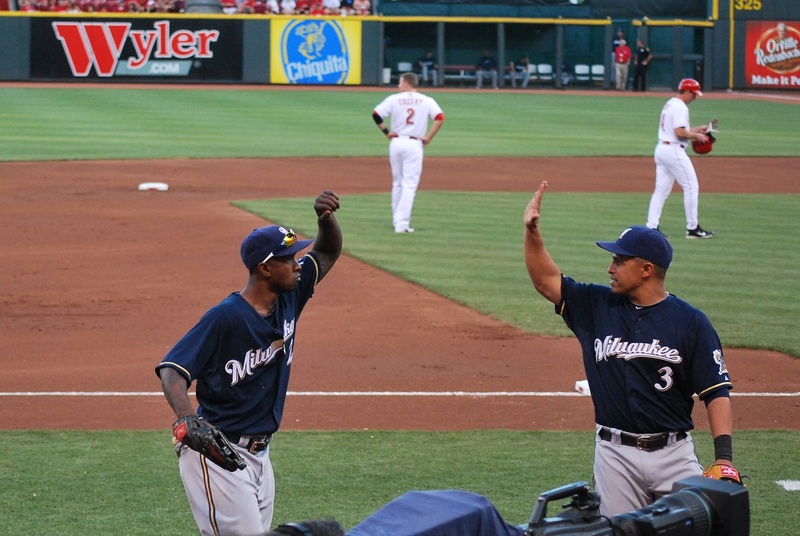 As he was nearing the dugout I got a picture of him getting ready to high-five César Izturis. I like that you can see Cozart in the background looking out towards where Morgan made the catch, still in disbelief. 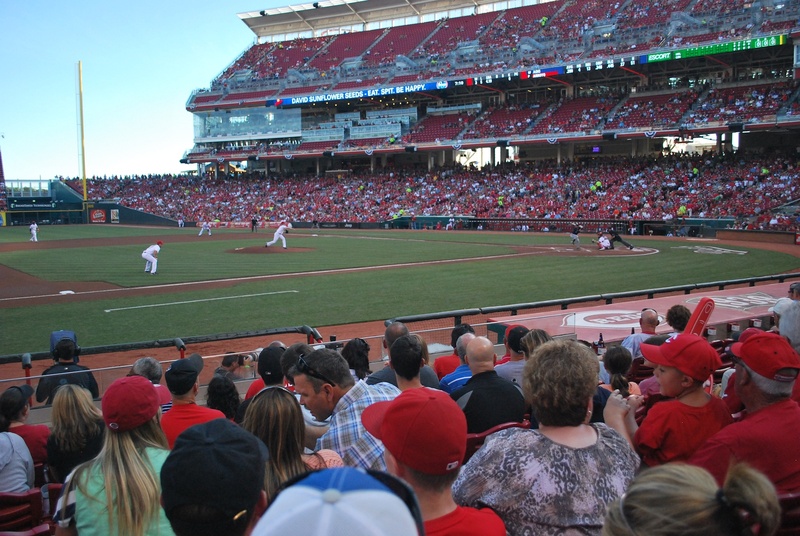 In the sixth the Reds got back to back one-out hits from Votto and Phillips and Jay Bruce stepped to the plate with two runners aboard. Estrada tried a 77 MPH curveball to start off the at bat and Bruce thanked him kindly by putting it over the centerfield fence to give the Reds a 3-0 lead. Arroyo had a no-hitter going, and luckily my tweet finally posted that said “Bronson Arroyo has a (cough) no-hitter (cough) through 7 innings. Jinx jinx jinx!! !” It worked, but maybe it was because I screamed something at the start of the eighth inning. Everyone knows that you’re not supposed to talk about the no-hitter and whatnot. Understanding this I waited until the music stopped right before Travis Ishikawa’s at bat was set to begin. I then put my hands around my mouth (to amplify my voice) and yelled “HEY BRONSON, DID YOU KNOW YOU HAVEN’T GIVEN UP A HIT YET?!?! ?” A guy in front of me was kind of upset and gave a half-hearted “come on, man.” I was really hoping Ishikawa would get a base hit, but he didn’t, and was called out on strikes. Right after he was rung up a lady in front of us turned around and yelled “HA!! !” really loud. She had some hate in her eyes and I was a little alarmed but I just laughed it off. I laughed even louder and gave my own “HA!” when Taylor Green doubled following a George Kottaras walk. Corey Hart pinch hit for Izturis, and lined one off the centerfield fence to cut the lead to 3-2. After Rickie Weeks popped out, Aoki came to the plate and hit the full count offering through the left side to drive in Hart, who slid home with the tying run. Check out Morgan getting down to let Hart know to slide, and also him screaming when he sees Hart is safe. Axford came out for the bottom of the eighth inning in a tie game, and I’m not sure why. 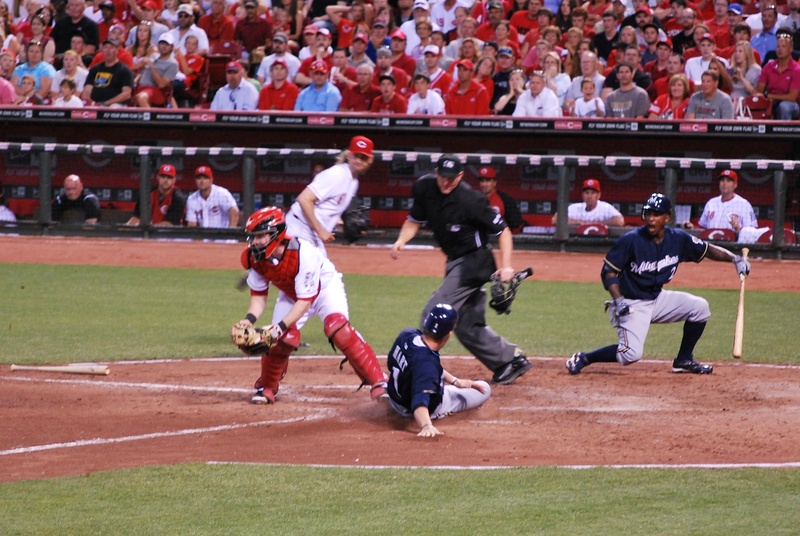 It wasn’t a save situation, but the Reds did have the meat of their order coming up. Stubbs led off for the Reds, and the first pitch he saw (a 95 MPH fastball) was crushed off the batter’s eye in straight-away centerfield to give the reds the lead. The Brewers failed to score in the top of the ninth, and that was that. Final Score: Reds 4 – Brewers 3. This losing thing is getting a little old. I haven’t missed a pitch since Wednesday vs. Toronto, and I’m hoping to keep it up. Since I’ll be delivering the game ball and rosin bag to the mound for today’s game, I’m hoping I don’t have to exit into one of the tunnels by the dugouts. If I do I will surely miss the first few pitches of the game since I’ll be leaving the field so close to first pitch. I’ll try to negotiate, and we’ll see how it goes.